When Kimberly was injured at work, she lost her job as a diesel mechanic. During 2015-16, Kim filled a voluntary post on a regulating board in Rhode Island. Despite all of her accomplishments, Kim missed working with her hands. For Kim, the loss of her career as a Diesel Mechanic felt like much more than losing a job. Kim didn’t know what trade she wanted to train for, or that MTTI had an HVAC/R program. Kim chose HVAC/R, feeling it would be a trade that would sustain her year round. Kim describes going back to school at the age of 48 as 'something like staring at a mountain’. Kim says her experience at MTTI 'couldn’t have been better'. The students in Kim’s class ranged in age from right out of high school to mid-sixties. Starting over herself, some of her younger classmates called her ‘Mama Kim’. Kim felt confident in her abilities as she approached internship. She rides in the truck with another Tech, Paul. He has been surprised at how excited customers are that the company has a female on board. 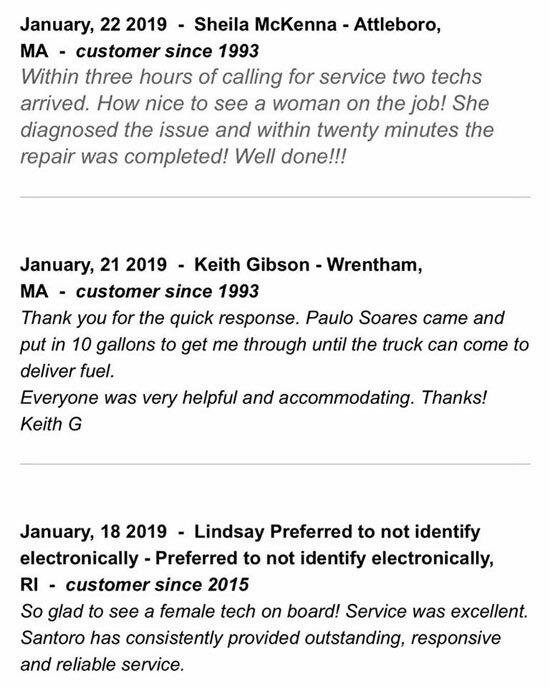 They hear from customers how nice it is to see a woman technician." Kim takes pride in her work. “Recently, when temperatures have been below freezing, we would pull up in the truck and see people sitting in the car. They were trying to stay warm, because their home had no heat. After a short service call, customers have heat and are no longer freezing. I’m tired at the end of the work day—but I feel a real sense of accomplishment." Before attending MTTI, Kim did check out other schools. 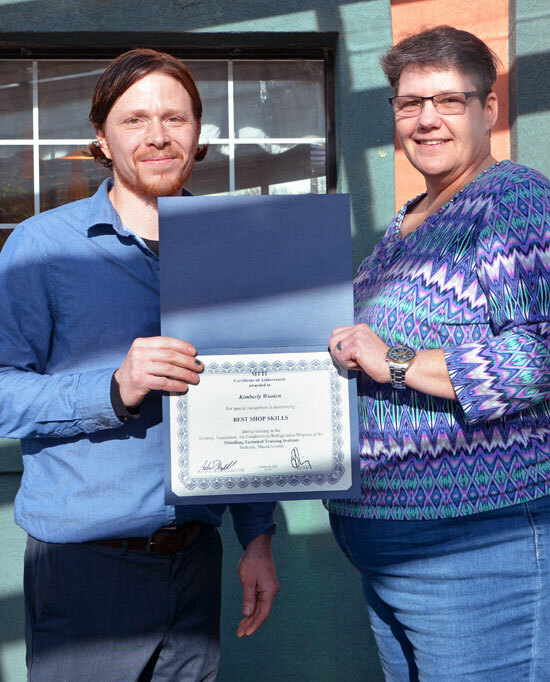 Photo: Left - Kim accepting her Award for Best Shop Skills from HVAC/R Instructor, Asher Marshall; Right - Santoro Facebook comments from customers about the service she and Paul have been providing this winter.